There’s a little slice of heaven on the west coast of Portugal that blends bucolic countryside with a magnificent coastline, all of which I discovered on a coastal walk along the Rota Vicentina from Odeceixe beach. The village itself is about 3 kilometres inland and has a relaxed, non-beachy charm all of its own. The River Seixe not only lends its name to this lovely spot, it forms the border between the Algarve and Alentejo regions at this point. It runs past the village through farmlands and wetlands then swirls across a great expanse of sand into the ocean at Odeceixe beach, creating a constantly shifting beachscape. I had chosen to stay in Odeceixe as part of my explorations of the Rota Vicentina walking trail that runs through the western part of the Algarve and Alentejo regions. As I was travelling alone and not keen on walking over 20 kilometres per day, not to mention the hassle of getting my luggage transferred, I found a few circular routes to try out. 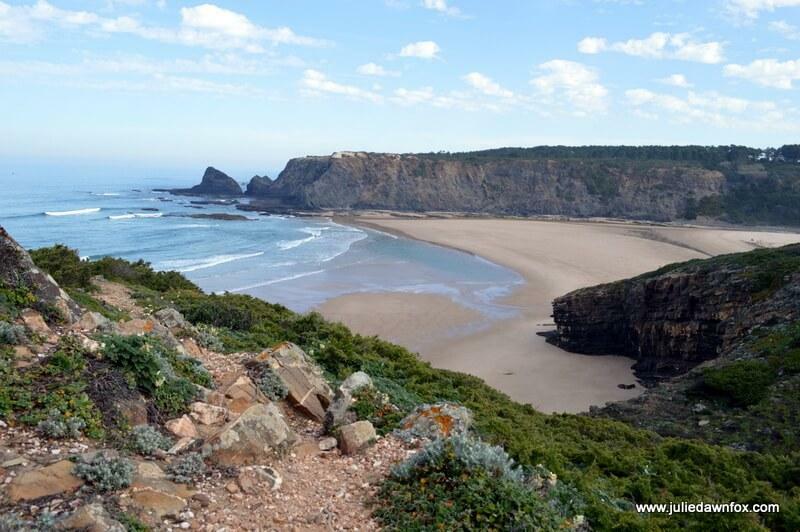 Note: If you prefer the idea of an organised self-guided or guided walking holiday along the Rota Vicentina, this tour between between Vila Nova de Milfontes and Odeceixe might appeal to you. At 13 km, the circular Odeceixe coastal walk sounded ideal. It’s a circular route that starts in Odeceixe village and should take you along the coastal Fisherman’s Route and connect you with the inland Historical Trail to bring you back to the starting point. I say should because I managed to miss some of the signs and ended up doing a slightly different circuit. The circular walk starts in Odeceixe’s main square, Largo 1 de Maio. Take the road that’s signposted for the praia (beach) at the side of AliSuper. As you leave the village, look out for a road sign and a path leading into the fields. 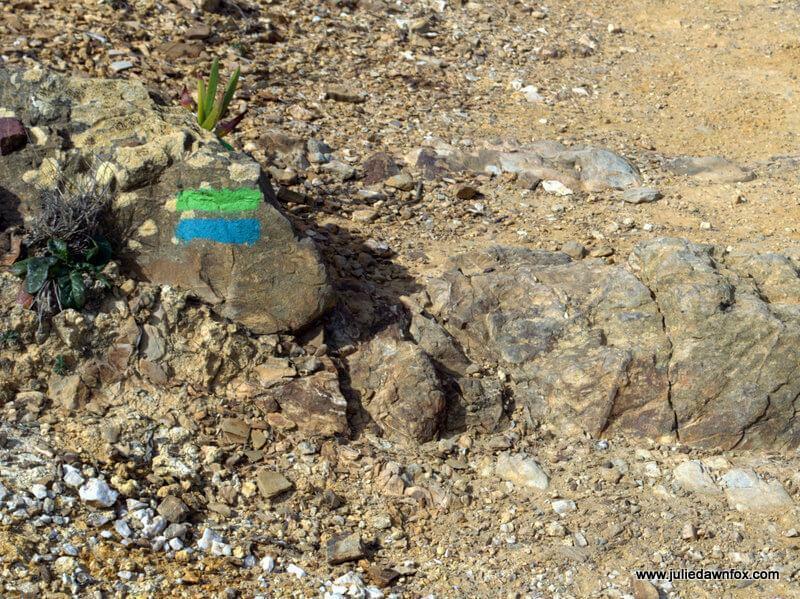 It’s marked with the blue and green Rota Vicentina waymarkers. If, like me, you manage to miss the turning, don’t worry. Just stay on the tarmac until you get to the beach. You’ll be compensated with horses, a donkey and quirky robot-like signs. Odeceixe beach itself is popular with surfers as well as families and there’s a smaller cove called Praia de Adega just to the south where you can run, or lounge, around naked if you wish. There are some kiosks overlooking the beach where you can grab a drink or a bite to eat as you take in the views. Of the normal beach, not the nudist one! Once you’re ready to continue walking to the clifftop path, just follow the road past the car parks until the blue and green Rota da Vicentina signs lead you off-tarmac. This clifftop section is undoubtedly the highlight of the Odeceixe Beach circuit, at least the version I ended up doing. I was in awe of nature with every step, what with jagged black cliffs jutting into frothy turquoise water and a profusion of wild flowers either side of the track. If you only have time or energy for a short walk, just do this section. You can drive the 3 kilometres from Odeceixe, or take the tourist train in summer, park up and walk along the sandy paths through beautiful flowers as far as the dragon-shaped cliff. You’ll see what I mean when you get there; the rocks curl round in the shape of a sleeping dragon which even looks as though it has scaly skin wrinkled around its shoulders. It’s a good job it’s not real as 3 brave fishermen were standing on its head. Just in case you don’t spot the dragon, the marked trail veers away from the coast at this point, which is your cue to turn around and retrace your steps if you’re not doing the circular walk. I was in nature heaven, and stopping every few seconds to take photos so I have no idea how long it would take you to do this linear section. Distance-wise, it’s about 3 km each way. I was planning to complete the circuit but I must have missed another sign because I ended up making my own loop instead of the official Rota Vicentina trail. I dutifully followed the waymarkers that lead me away from the cliff edge through pine trees and into farmland. The problem came when I reached a crossroads and couldn’t find any signs to guide me. Luckily, I’ve got GPS on my phone so I was able to confirm my hunch that Odeceixe lay to my left and, rather than risk going miles out of my way, I decided to make my way back along the tarmac road. If you decide to follow in my footsteps, this will mean turning left at the crossroads then right and right again to get you on the road back to Odeciexe. Once on the road that runs alongside the river, look out for a dirt track on the left. This is the marked part of the trail through the fields which I missed on the way out. For such a small place, Odeceixe has more than its fair share of accommodation and eating options. This is obviously due to the popularity of its beach but despite catering for visitors, the village has retained its unhurried, untouristy character. The main square is still a meeting place for locals to catch up on gossip and the cobbled streets leading off it are quiet. I wouldn’t recommend the place I stayed but there are several accommodation options in and around Odeceixe to suit different tastes and budgets. Casas do Moinho is a cluster of beautifully renovated cottages spreading uphill as you leave the village. With an outdoor pool and views to die for plus a nearby restaurant, you may not want to leave, especially since there’s a thoughtful welcome package. Choose from rooms, suites and mezzanine apartments. Casa de Hóspedes Celeste is a simple, clean guest house in the centre of the village with the bonus of parking facilities and friendly staff. Check availability and prices. Casa Morais is not everyone’s cup of tea but if you like the notion of staying with Portuguese ‘grandparents’ who don’t speak much English but are welcoming and helpful, check out their bed and breakfast facilities. If you have the flexibility of a car, you’ll find some delightful farm stays and rural accommodations near Odeceixe. Monte João Roupeiro is one such place with a duck-filled, flower-fringed lake and a large outdoor pool. Breakfast is fabulous and contains fresh homegrown produce and their are home made cakes to boot. Choose from a double room of self-contained apartment. Quinta Pero Vicente has donkeys to pet, free bikes and plenty of hammocks plus lots to discover in the grounds of this pet friendly farm stay. Good breakfast and a caring host make this a special and relaxing place to stay, especially if you’re doing the Rota Vicentina. If you arrange it in advance, they will prepare an evening meal for you. Check photos and availability. I was delighted to stumble across your blog and learn about the Odeceixe Beach Circuit and the dragon. We will be staying there for 4 days in early June and planned on hiking parts of the Rota Vincentina. A circular route is ideal. We’ll just be sure to wear sturdy hiking shoes and keep a careful eye out for those markers! Hi Kaeleen, the good news is that they’ve been developing more circular routes which should now be clearly marked as such. You can download route info from the Rota Vicentina website. Have fun! This is the dreaded beach where I broke my flipflop wading the river and had to hobble all the way back to the village where our car was parked! So I didn’t see your lovely dragon. Shame! But the area was 100% beautiful, and very peaceful in May. You’ll love it, Brid. Porto Covo is very pretty, as is Vila Nova de Milfontes.